In April 2018, I will run the Boston Marathon – all 26.2 miles! No, I did not qualify by time. But running the Boston Marathon has been a goal of mine – and to make it a reality, I committed to raising $4,000 for PSP. Thank you for donating today – the NICU families navigating their own medical marathon challenges are lucky for your support of PSP. Our boys, Sam and Max, were born in November 2012 at only 32 weeks – 8 weeks early. At just 4.5lbs and 4.6lbs, they could fit in the palm of my hand and needed to spend some time in more intensive care than most babies that head home after a day or two. Instead of coming home to join their older sister and family, they spent the first month+ of their lives, including their first Thanksgiving and Christmas, in the NICU at Beth Israel Hospital in Boston. Life with babies in the NICU isn’t easy. Despite being fortunate to live close by and knowing they had some world-class care, my wife (Sara), daughter (Mae – 3.5 years at the time), and I found ourselves visiting our new family – finding hours during the day or night to visit with Sam and Max, hoping that the Dr. would tell us they could come home. On one visit just before Christmas, we were amazed to find two bags with soft fleece blankets, holiday books, and all the little things we still seemed to wish we’d remembered on a visit, along with a wonderful letter offering encouragement and understanding, all from an organization we’d never heard of – Project Sweet Peas. The generosity of the gifts – given to every patient in the NICU that day – and the knowledge that others had been where we were, brought a profound sense of joy, happiness, and hope to our family, and all others alongside us dealing with an otherwise stressful experience. PS: Sam and Max just turned 5 and are doing great! With their big sister leading the cheers, they will mostly likely be racing me down the marathon course until they realize I’m not carrying snacks, and our family couldn’t be luckier for having them. No record breaking times – just running for a great cause! 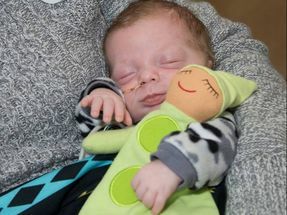 Not all families in the NICU are as fortunate as we were to have two relatively healthy, growing infants that were able to come home after a short stay. 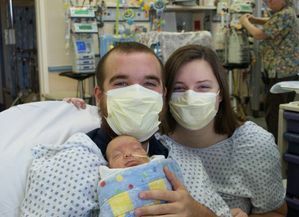 When offered a chance to run in support of a charity – I wanted to help a local organization that, like many NICU patients is small, but mighty. And one whose small token offering encouragement and care for our family is still something we remember today. 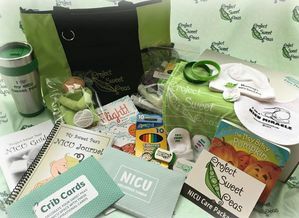 The generosity and support provided by PSP is such an amazing force, offering families in the NICU everything from care packages, to financial support, and sadly, even bereavement support. I am honored and excited to be able to help offer their cause encouragement and support in my own way.